You can read the original article here. 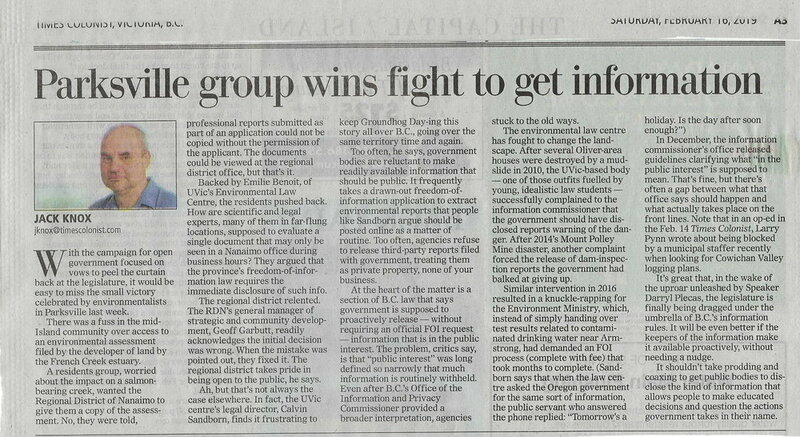 The District of Oak Bay takes months to reply to FOI requests, as does BC Housing. Is it time they lifted they complied with the spirit of the law? With the campaign for open government focused on vows to peel the curtain back at the legislature, it would be easy to miss the small victory celebrated by environmentalists in Parksville last week. There was a fuss in the mid-Island community over access to an environmental assessment filed by the developer of land by the French Creek estuary. A residents group, worried about the impact on a salmon-bearing creek, wanted the Regional District of Nanaimo to give them a copy of the assessment. No, they were told, professional reports submitted as part of an application could not be copied without the permission of the applicant. The documents could be viewed at the regional district office, but that’s it. Backed by Emilie Benoit, of UVic’s Environmental Law Centre, the residents pushed back. How are scientific and legal experts, many of them in far-flung locations, supposed to evaluate a single document that may only be seen in a Nanaimo office during business hours? They argued that the province’s freedom-of-information law requires the immediate disclosure of such info. The regional district relented. The RDN’s general manager of strategic and community development, Geoff Garbutt, readily acknowledges the initial decision was wrong. When the mistake was pointed out, they fixed it. The regional district takes pride in being open to the public, he says. Ah, but that’s not always the case elsewhere. In fact, the UVic centre’s legal director, Calvin Sandborn, finds it frustrating to keep Groundhog Day-ing this story all over B.C., going over the same territory time and again. Too often, he says, government bodies are reluctant to make readily available information that should be public. It frequently takes a drawn-out freedom-of-information application to extract environmental reports that people like Sandborn argue should be posted online as a matter of routine. Too often, agencies refuse to release third-party reports filed with government, treating them as private property, none of your business. At the heart of the matter is a section of B.C. law that says government is supposed to proactively release — without requiring an official FOI request — information that is in the public interest. The problem, critics say, is that “public interest” was long defined so narrowly that much information is routinely withheld. Even after B.C.’s Office of the Information and Privacy Commissioner provided a broader interpretation, agencies stuck to the old ways. The environmental law centre has fought to change the landscape. After several Oliver-area houses were destroyed by a mudslide in 2010, the UVic-based body — one of those outfits fuelled by young, idealistic law students — successfully complained to the information commissioner that the government should have disclosed reports warning of the danger. After 2014’s Mount Polley Mine disaster, another complaint forced the release of dam-inspection reports the government had balked at giving up. In December, the information commissioner’s office released guidelines clarifying what “in the public interest” is supposed to mean. That’s fine, but there’s often a gap between what that office says should happen and what actually takes place on the front lines. Note that in an op-ed in the Feb. 14 Times Colonist, Larry Pynn wrote about being blocked by a municipal staffer recently when looking for Cowichan Valley logging plans. It’s great that, in the wake of the uproar unleashed by Speaker Darryl Plecas, the legislature is finally being dragged under the umbrella of B.C.’s information rules. It will be even better if the keepers of the information make it available proactively, without needing a nudge. It shouldn’t take prodding and coaxing to get public bodies to disclose the kind of information that allows people to make educated decisions and question the actions government takes in their name.